Yesterday, I was recording the weekly "I Was Broke. Now I'm Not!" podcast (iTunes; Non-iTunes) at an abnormal location – my house. I experienced a technical difficulty at about 2 minutes 36 seconds into the podcast. The technical difficulty? My stupid cat. Having never recorded the podcast at my house before, I failed to realize that my cat would show up and request (demand) to be petted. She came trotting in – collar bell ringing and all. The result? Well, I can't really describe it, but it was all caught on the podcast. I have cut that section out for your listening pleasure HERE. A few seconds into it, you will start hearing the cat's jingling bell. You will hear it close in on the microphone and then … well, you will have to listen to it! Why not SUBSCRIBE to the podcast? A new episode is issued every Thursday morning and is less than 10 minutes in length! 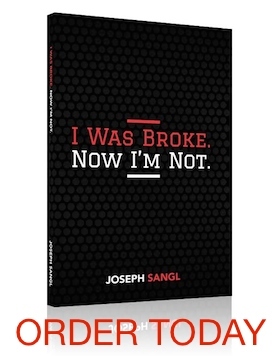 In each podcast, I share a success story and a question from the www.JoeSangl.com community. I promise you that you will be motivated and inspired by this podcast! Click here to automatically receive each post in your E-MAIL! O.K. The giant thud in the middle of a pause is completely hilarious. This is further proof to my theory that cats are from the devil. That is why pagans used to worship them. My kids are wondering why I just laughed out loud by myself! 😉 too funny! Jingle Jingle… Thud… “Good Grief!” That was hilarious! Reminded me of Charlie Brown!